Stop wasting time and money on expensive gym memberships. SoozierÆs all-in-one home gym equipment offers everything you need to tone and strengthen all major muscle groups right in the comfort of your home. It allows you to work the entire body and burn calories while increasing muscle mass. The resistance style training youÆll receive not only builds strength, but also boosts metabolism allowing you to lose even more weight. ItÆs also safer and easier than a traditional free weight gym due to the weight stack which doesnÆt need loading or unloading and is never suspended above you. - Push Up Bar Size: ✔1" x 0.25"
- Swing Arm Bar Size: ✔2"
✔ DURABLE CONSTRUCTION: Our home gym features all-steel construction for superior strength and durability. 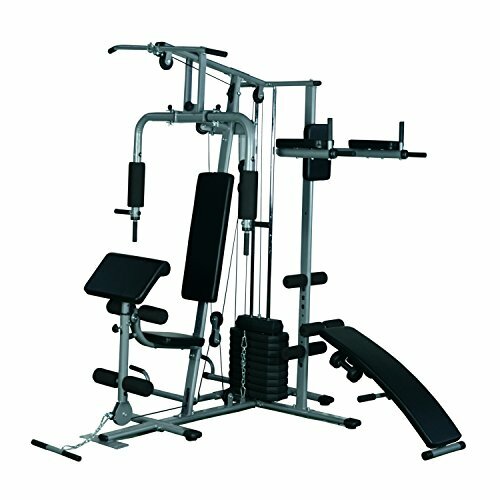 Enjoy effective resistance training at home with our built-to-last gym! ✔ DUAL ACTION PRESS ARMS: Dual action press arms allow you to perform chest press, vertical butterfly exercises and pec fly exercises with relative ease. ✔ UPPER PULLEY: Focus on your core muscles while performing ab crunches with the upper pulley. The selectorized weight stack allows you to adjust and control the resistance. ✔ LEG DEVELOPER: The total leg developer makes it easy to work your lower body muscles. The foam roller pads provide a more comfortable workout experience. ✔ WEIGHT STACK LOCK: Loading and unloading weight plates is no longer a hassle. The selectorized weight with lock allows you to do resistance training safely, and is never suspended above you.